Background and Aim: Inflammatory myofibroblastic tumors (IMFTs) are uncommon neoplasms of the central nervous system (CNS) of intermediate grade biologic potential. Anaplastic lymphoma kinase (ALK-1), a diagnostic marker of anaplastic large cell lymphoma, is also expressed in a subset of IMFTs and appears to have prognostic significance. Though, few studies have evaluated expression of ALK-1 in IMFTs of the CNS. This retrospective study was undertaken to evaluate the expression of ALK-1 expression in IMFT of CNS by immunohistochemistry and correlate with the clinical, radiological and pathologic features. Materials and Methods: Five cases diagnosed as IMFT/inflammatory pseudotumour/plasma cell granuloma, diagnosed in CNS over 10 year period (1998-2007) were retrieved from the archives of Department of Neuropathology of a tertiary referralcenter. The clinical profile and imaging features were collected from the case records. Hematoxylin and eosin stained sections were reviewed with immunohistochemistry for smooth muscle actin (SMA), vimentin, desmin, ALK-1, p53, MIB-1, CD68, leukocyte common antigen, CD3, and CD20. Results: All five cases of IMFTs presented as dural-based space occupying or en-plaque lesions. 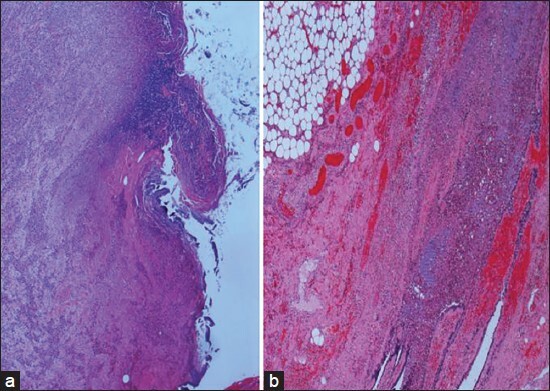 Histologically, four cases had combined plasma cell granuloma-fibrous histiocytoma morphology, and one had fibrous histiocytoma-like morphology. Immunohistochemically, SMA was strongly positive in spindle cell component of the tumors confirming diagnosis. ALK-1 expression could not be detected by immunohistochemistry in any of the cases. Conclusion: Further studies analyzing ALK-1 gene mutation and rearrangements are required to determine pathogenetic role, if any, in CNS IMFTs. Context: Secretory meningioma is a rare subtype of meningiomas, displaying epithelial and secretory differentiation of meningothelial cells. It has unique radiological, morphological, and immunohistochemical features, but runs a benign course. Radiological picture because of the variable degrees of peritumoral edema can be confused with aggressive neoplasms. Morphologically, it is difficult to distinguish secretory meningioma from other tumors having a clear cell appearance and aggressive clinical behavior. Materials and Methods: Retrospective analysis over a period of 16 years (1997-2012) brought out five cases diagnosed as secretory meningioma. The slides were restained and subject to special stains and immunohistochemistry and the clinical details were retrieved. Results: On histopathology, the tumors showed a characteristic vacuolated appearance due to the presence of variably sized intracytoplasmic lumina. 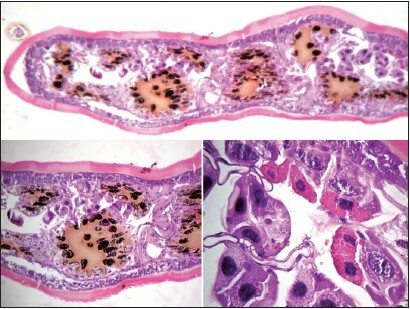 Another unique feature was the presence of hyaline inclusions within these intracytoplasmic lumina and in the intercellular spaces. These inclusions were periodic acid-Schiff positive diastase-resistant, yellowish-orange on Elastic Van Giesson stain and strongly carcinoembryonic antigen positive. Conclusion: Owing to its rarity and unique morphology secretory meningioma poses a diagnostic challenge to the pathologists. As this tumor follows a benign course, it is crucial to correctly diagnose this entity to avoid unnecessary over treatment. Purpose: Many virulence factors are involved in the pathomechanism of infection caused by Helicobacter pylori. Toxins such as vacuolating cytotoxin, encoded by the vacA gene and the immunogenic protein cagA, encoded by the cagA gene (cytotoxin-associated gene) are major factors conferring the property of virulence. The current study is aimed at isolation of H. pylori and separation of its toxin from antral biopsies of patients. Materials and Methods: The following cell lines were used to demonstrate the cytopathic effect (CPE) of the separated toxin: African green monkey kidney (Vero), baby hamster kidney, human lung carcinoma (LLC-MK2), and human epithelial. Results: H. pylori was isolated from 27 out of 45 patients (60%) selected for the study. CPE of H. pylori toxin was highly significant on Vero cells than other cell lines used as it reached a high dilution titer of toxin (1/16) in 13 isolated strains (48.15%). No significant difference in CPE of toxin in different dilutions was detected among other cell lines used in different groups. 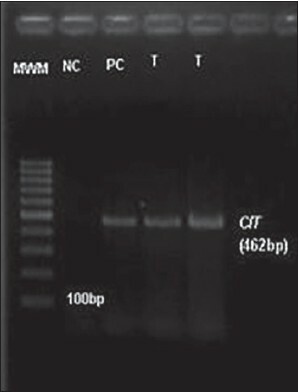 H. pylori toxin could be detected by sodium dodecyl sulfate-polyacrylamide gel electrophoresis analysis as a distinct band with a molecular weight ranging between 66 and 97 kDa and closely related to 87 kDa. Conclusion: H. pylori vacuolating cytotoxin plays a vital role in the pathogenesis of gastroduodenal diseases (gastritis, gastric ulcer, duodenal ulcer, and gastric cancer). The Vero cell lines were found to be the most suitable form of tissue culture when compared with other cell lines used in our study for demonstrating the activity of H. pylori toxin. 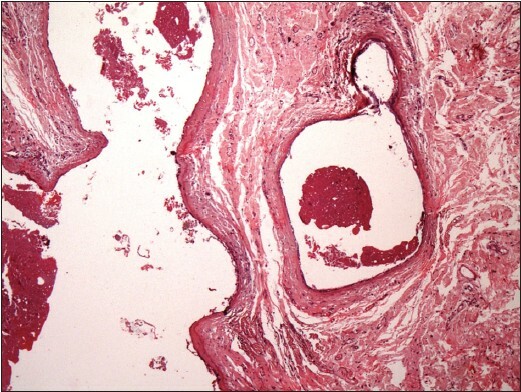 Context: Vascular anomalies present diagnostic challenges to histopathologists. Mulliken and Glowacki's classification categorizes vascular lesions into hemangiomas and vascular malformations. Aim: This study explored diagnostic clues in the histomorphology of hemangiomas and vascular malformations. Materials and Methods: A total of 120 cases of benign vascular lesions were retrieved from 12 years period. A total of 94 cases, where complete clinical details and representative paraffin sections were available, were included in this study. Hematoxylin and eosin (H and E) stain and Verhoeff's stain for elastic tissue were done on all cases and lesions were classified into hemangiomas or arterio-venous malformations (AVM). Mast cell density in all lesions was calculated from toluidine blue stained sections. Results: Ten cases of hemangiomas were reclassified as AVM on the basis of presence and absence of arteriovenous structures. Intra-lesional nerves were seen in significantly higher number of AVMs compared to hemangiomas. Medium and thick sized nerve bundles were seen in 56% of AVMs, while they were not seen in any of the hemangiomas. Mean mast cell density was significantly higher in proliferating hemangiomas (53.12 ± 27.83 cells/mm 2 ) compared to involuting hemangiomas (11.43 ± 7.9 cells/mm 2 ). Conclusions: Use of elastic tissue stains are useful ancillary tools to distinguish between AVMs and hemangiomas. The presence of arteries and arterioles are an integral part of AVMs. The presence of the intra-lesional nerves can be useful to distinguish between AVMs and hemangiomas even on H and E stained sections. The significantly higher mast cell density seen in proliferating hemangiomas compared with involuting ones, seem to suggest that mast cells play an important role in the natural history of these lesions. Context: Neonatal cholestasis (NC) lasting more than 2 weeks affects one in 2500 live births. Extrahepatic biliary atresia (EHBA) and idiopathic neonatal hepatitis account for about 70% of all cases of NC. Differentiating these two conditions is important as patient management is very different for both the conditions. Aims: To assess the usefulness of the seven-feature, 15-point histological scoring system in the interpretation of liver biopsy in NC and usefulness of immunostaining with CD56 (N-CAM) in EHBA. Settings and Design: Retrospective study of 5 years' duration at a pediatric referral institute, where the case load of NC is high and definitive surgery for EHBA is undertaken after histological confirmation. Materials and Methods: The study is of a 5-year duration conducted between June 2007 and May 2012. A total of 210 cases of NC were clinically diagnosed during this period. All the slides were reviewed with reference to a seven-feature, 15-point histological scoring system assessing its usefulness in the interpretation of liver biopsy in NC and utility of the immunohistochemical marker CD56 was also assessed as an aid in the characterization of bile ductular proliferation in EHBA. Statistical Analysis: Statistical analysis was performed and sensitivity and specificity of the histological scoring system for EHBA was analyzed. Results: Of the 210 liver biopsies reviewed using the scoring system, 122 cases were diagnosed as EHBA and 88 cases were diagnosed as other causes of NC. The overall sensitivity of this scoring system was 95.5%, specificity was 93.1% and diagnostic accuracy was 94.6%. Conclusions: The seven-feature, 15-point histological scoring system has good diagnostic accuracy in the interpretation of liver histology in NC as advanced histopathological findings even at younger age require immediate surgery. CD-56 is a useful marker in the assessment of bile ductular proliferation in EHBA. Introduction: HER 2 Neu protein overexpression and its detection by immunohistochemistry (IHC) has become quiet critical because of its relevance in regards to Herceptin treatment. This peer review was done at a tertiary care center, which aimed at determining the inter-observer variation among five pathologists and evaluating the degree of agreement between them. Aims: The aim of our study was to determine the reproducibility of HER 2 Neu system of reporting in breast cancer cases and determine inter-observer variability among five pathologists at a tertiary care center. To compare the results with similar studies done at other centers. Settings and Design: Retrospective descriptive study. 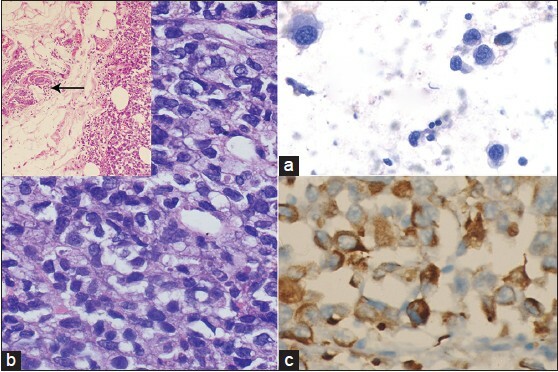 Materials and Methods: Hematoxylin and Eosin (H and E) and IHC stained slides of 104 cases of carcinoma breast, on which HER 2 Neu status had been reported were reviewed. The time period for selection was from January 2010 to December 2011 (2 year period). Five pathologists reviewed the H and E and IHC slides independently and scored the results on a specially designed work sheet. Kappa values for inter-observer variation and Cornbach's alpha for internal consistency were calculated. Statistical Analysis Used: SPSS 20.0 (IBM). not known. Results: Complete agreement was seen between all five pathologists in 70 cases (70/104) = 67%. Agreement between four pathologists was seen in 78 cases (78/104) = 75%. Agreement between three pathologists was seen in 92 cases (92/104) = 88%. The global value for kappa co efficient for agreement between two pathologists was 0.706 and Cornbach alpha for internal consistency of reporting in the department was 0.987. Conclusion/Key Messages: Our departmental peer review indicated that there is good inter-observer concordance (agreement between two pathologists) and there is strong overall internal consistency of reporting for HER 2 Neu reporting by IHC. Our results are comparable to International reported data of similar studies. Context: Tumor necrosis factor-α (TNF-α) is an important mediator in the pathogenesis of psoriasis. Nuclear factor-kappaB (NF-κB) is a transcription factor that regulates the activity of the proinflammatory genes. Psoriasis is an inflammatory disease and the role of TNF-α and NF-κB, should be considerable. Aims: We studied the role of TNF-α and NF-κB in psoriasis. Materials and Methods: A total of 61 cases of psoriatic skin biopsies were studies and the grade of TNF-α and NF-κB, staining was correlated with the histopathological indices of severity. Statistical Analysis Used: Pearson's correlation coefficient and Chi-square test. Statistical Package for Social Sciences version 13 was used. Results: The TNF-α immunostain in the cytoplasm of the epidermal cells and basal cells showed a strong inverse correlation with the grade of epidermal hyperplasia (P -0.019 and P -0.009, respectively). The epidermal cytoplasmic positivity and lymphocyte positivity for TNF-α did not correlate with the grade of NF-κB immunostaining in the epidermal cell nuclei, basal cells or lymphocytes. The basal cell cytoplasmic positivity for TNF-α correlated with the grade of NF-κB immunostaining in the nucleus of basal cells at a P - 0.005. There was a strong correlation between the epidermal cytoplasmic TNF-α immunostaining with the lymphocyte immunostaining (P -0.08); however, there was no correlation between the TNF-α expression in the other two locations. Conclusions: The study outlines the relationship between NF-κB and TNF-α and their combined role in the development of the characteristic histopathological changes in psoriasis. We hypothesize that NF-κB is involved in stimulating the release of TNF-α which would account for the characteristic histopathological changes of psoriasis. However, it is likely that NF-κB can act independently of TNF-α also in the pathogenesis of psoriasis. Background: Gastrointestinal stromal tumors (GISTs) are biologically distinctive neoplasms harboring KIT and PDGFRA mutations. 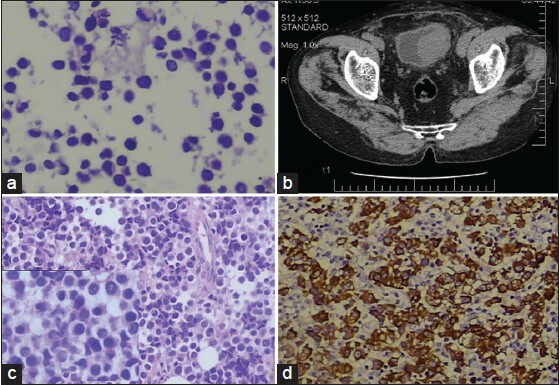 Cytokeratin expression in GISTs is an under-recognized diagnostic pitfall, especially in high grade GISTs with limited biopsy material and from metastatic sites. Materials and Methods: We evaluated the histomorphology and expression of four 'broad-spectrum' cytokeratin markers, AE1-AE3, CAM 5.2, MNF-116, and 34βE12 in 64 GISTs diagnosed over a 68-month period. Individual cytokeratins 5, 6, 7, 8, 14, 17, 18, 19, and 20 were investigated in the 'broad-spectrum' cytokeratin-positive GISTs. Results: Of 64 GISTs, 10 (15%) demonstrated cytokeratin immunopositivity. All 10, considered high risk by the National Institutes of Health consensus approach, were immunopositive for CAM 5.2 and MNF-116. Seven were AE1-AE3 immunopositive. Cytokeratins 8 and 18 were confirmed in 10 and 9 GISTs, respectively. One GIST demonstrated biphasic morphology with cytokeratin immunonegativity in low-grade spindle and immunopositivity in high-grade epithelioid foci. KIT and PDGFRA mutational analysis, undertaken in 5/10 cytokeratin-positive GISTs, harbored KIT exon 11 mutations. Conclusion: We hypothesize that cytokeratin expression exclusively in high risk GISTs is a consequence of tumor progression. Given the increasing number of commercially available broad-spectrum cytokeratin immunomarkers, including those reacting with cytokeratins 8 and 18, cytokeratin-positive GISTs must be differentiated from carcinomas, melanomas, and a range of cytokeratin-positive sarcomas to ensure optimal patient management and prognostication. Background: Dematiaceous fungi appear brown in tissue section due to melanin in their cell walls. When the brown color is not seen on routine H and E and culture is not available, differentiation of dematiaceous fungi from other fungi is difficult on morphology alone. Aims and Objective: To study if melanin production by dematiaceous fungi can help differentiate them from other types of fungi. 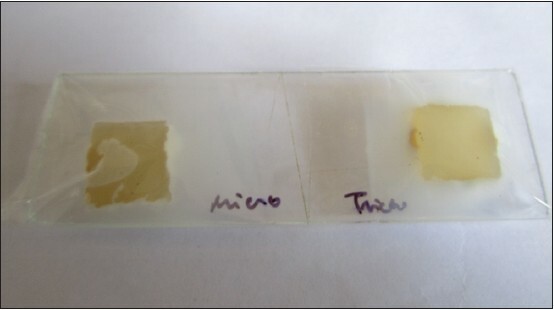 Materials and Methods: Fifty tissue sections of various fungal infections and 13 smears from cultures of different species of fungi were stained with Masson Fontana stain to assess melanin production. The tissue sections included biopsies from 26 culture-proven fungi and 24 biopsies of filamentous fungi diagnosed on morphology alone with no culture confirmation. Results: All culture-proven dematiaceous fungi and Zygomycetes showed strong positivity in sections and culture smears. Aspergillus sp showed variable positivity and intensity. Cryptococcus neoformans showed strong positivity in tissue sections and culture smears. Tissue sections of septate filamentous fungi (9/15), Zygomycetes (4/5), and fungi with both hyphal and yeast morphology (4/4) showed positivity for melanin. The septate filamentous fungi negative for melanin were from biopsy samples of fungal sinusitis including both allergic and invasive fungal sinusitis and colonizing fungal balls. Conclusion: Melanin is produced by both dematiaceous and non-dematiaceous fungi. Masson-Fontana stain cannot reliably differentiate dematiaceous fungi from other filamentous fungi like Aspergillus sp; however, absence of melanin in the hyphae may be used to rule out dematiaceous fungi from other filamentous fungi. 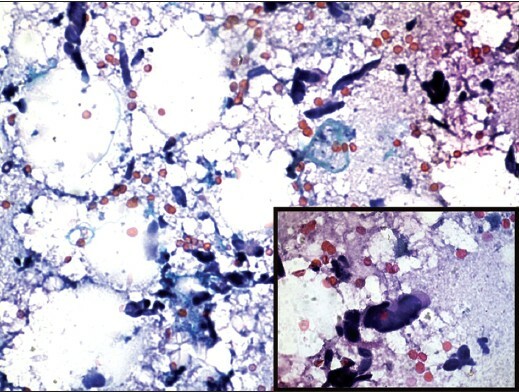 In the differential diagnosis of yeast fungi, Cryptococcus sp can be differentiated from Candida sp by Masson-Fontana stain in tissue sections. Context: The diagnosis of malignant and potentially malignant epithelial lesions of the oral mucosa cannot be based solely on clinical findings. The histologic evaluation of a representative biopsy specimen thus becomes necessary. The site for biopsy however is always a subjective choice that sometimes raises doubts about its representativeness. So far, no simple and reliable method is available for the selection of the most appropriate area for biopsy. Colposcopy is helpful in the selection of these sites of epithelial dysplasia depending upon the vascular patterns. Aims: This study was planned to assess the role of Colposcopic examination in the selection of biopsy site in patients with varying grades of oral epithelial dysplasia at various sites. Settings and Design: One hundred and eighty patients between the ages of 30 and 60 years clinically diagnosed with leukoplakia and carcinoma buccal mucosa were included in the study. Materials and Methods: For each of the subjects, a thorough clinical examination followed by Colposcopic assessment was carried out for the selection of biopsy site from the involved mucosa. 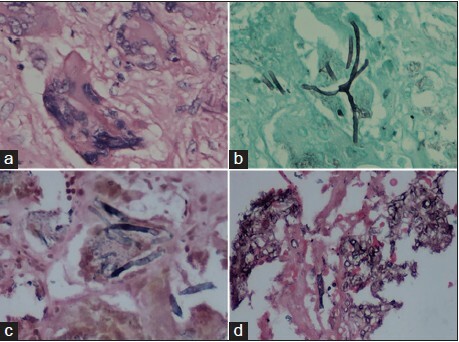 The histopathological findings were then compared in the two cases and results analyzed. Statistical Analysis Used: The statistical analysis was performed using a paired t-test. Results: In our study, sensitivity and specificity for the selection of biopsy site by Colposcopic examination was found to be higher for leukoplakia than for carcinoma buccal mucosa. Conclusions: It was concluded that Colposcopic examination was found to be significant in the selection of biopsy site for leukoplakia while clinical criterion was found to be more appropriate for carcinoma buccal mucosa cases. Aims: This study aims to establish biological reference interval for novel platelet parameters. Settings and Design: A total of 945 healthy individuals, age ranges from 18 to 64 years (881 males and 64 females) coming for voluntary blood donation from June to August 2012 (3 months) were enrolled after exclusion of rejection criteria. Materials and Methods: The samples were assayed by running in complete blood count + reticulocyte mode on the Sysmex XE-2100 hematology analyzer and the reference interval for the population was calculated using Clinical and Laboratory Standards Institute guidelines. Statistical analysis used: Tests were performed using SPSS (Statistical Product and Service Solutions , developed by IBM corporation), version 13. Student t test and pearsons correlation analysis were also used. Results: The normal range for various parameters was platelet count: 150-520 × 10 3 /cu mm, immature platelet fraction (IPF): 0.3-8.7%, platelet distribution width (PDW): 8.3-25.0 fL, mean platelet volume (MPV): 8.6-15.5 fL, plateletcrit (PCT): 0.15-0.62%, high immature platelet fraction (H-IPF): 0.1-2.7%, platelet large cell ratio (P-LCR): 11.9-66.9% and platelet-X (PLT-X) (ch): 11.0-22.0. Negative correlation was observed between platelet count (r = −0.468 to r = −0.531; P < 0.001) and PCT (r = −0.080 to r = −0.235; P < 0.05 to P < 0.001) with IPF, PDW, MPV, H-IPF, P-LCR, and platelet-X. 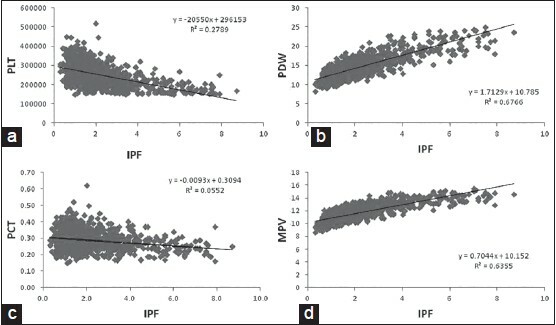 IPF/H-IPF showed a positive correlation among them and also with PDW, MPV, P-LCR, platelet-X (r = +0.662 to r = +0.925; P < 0.001). Conclusions: These novel platelet parameters offer newer avenues in research and clinical use. Establishing biological reference interval for different platelet parameters would help determine true high and low values and help guide treatment decisions. Background: The hereditary hemoglobin (Hb) disorders are the most commonly encountered single gene disorders in India. Data pertaining to the pattern of hemoglobinopathies and thalassemias is scarce in North East India, and hence it was considered worthwhile to study these disorders using a large series of patients referred to a clinical diagnostic laboratory. Aims: A total of 9000 patients referred for Hb variant analysis were studied to identify hemoglobinopathies and thalassemias in Upper Assam region of North East India. 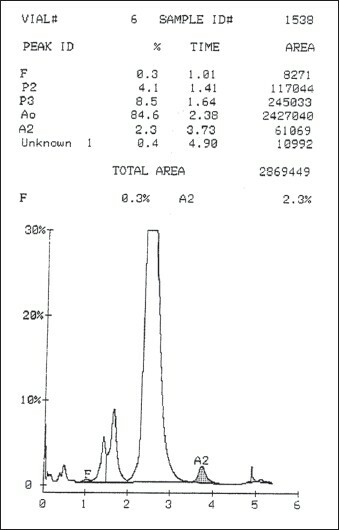 Materials and Methods: This study was performed by high performance liquid chromatography (HPLC) using BIORAD variant Hb typing system. Results: Out of 9000 patients studied, abnormal Hb fractions were seen in 5320 patients. The HbE gene was detected in 4315 patients of which HbE trait was seen in 2294 followed by HbE disease in 1892. There were 114 HbE beta thalassemia patients and 15 double heterozygotes of HbE with HbS or HbD. Beta thalassemia trait was seen in 313 patients and beta thalassemia homozygous in 32. HbS gene was detected in 460 patients comprising of HbS trait in 189, HbS disease in 203, S beta thalassemia in 53 and double heterozygotes of SD and ES in 15. The rest comprised of HbD trait in 6, delta beta thalassemia in 33, hereditary persistence of fetal hemoglobin trait in 5 and J chain hemoglobinopathy in 8 patients. Evidence of alpha thalassemia though suspected, could not be confirmed. Conclusion: A high incidence of hemoglobinopathies and thalassemias and their combinations is unique for this part of the country. Background: β-lactam resistance is more prevalent in Gram negative bacterial isolates worldwide, particularly in developing countries. In order to provide data relating to antibiotic therapy and resistance control, routine monitoring of corresponding antibiotic resistance genes is necessary. Aims: The aim of this study was the characterization of β-lactam resistance genes and its plasmid profile in bacteria isolated from urinary tract infection samples. Materials and Methods: In this study, 298 Gram negative bacteria isolated from 6739 urine specimens were identified by biochemical standard tests. Antimicrobial susceptibility testing was performed by the disk diffusion method. Extended-spectrum β-lactamase (ESBL)-producing strains were also detected by the double-disk synergy test. The presence of blaTEM and blaSHV genes in the strains studied was ascertained by polymerase chain reaction. Results: Of all Gram negative bacteria, Escherichia coli (69.1%) was the most common strain, followed by Klebsiella sp. (12.1%), Enterobacter sp. (8.4%), Proteus sp. (4.4%), Citrobacter (4%) and Pseudomonas sp. (2%). The most antibiotic resistance was shown to tetracycline (95.16%), nalidixic acid (89.78%) and gentamycin (73.20%) antibiotics. Among all the strains tested, 35 isolates (11.75%) expressed ESBL activity. The prevalence of TEM and SHV positivity among these isolates was 34.29%, followed by TEM (31.43%), TEM and SHV negativity (20.0%) and SHV (14.29%), respectively. Conclusions: Regular monitoring of antimicrobial drug resistance seems necessary to improve our guidelines in the use of the empirical antibiotic therapy. Aim: This study was carried out to determine the presence of blaTEM , blaSHV and blaCTX-M genes in extended-spectrum β-lactamase (ESBL) producing Escherichia coli (E. coli) and Klebsiella pneumoniae (K. pneumoniae) at a tertiary care referral hospital in Northeast India. Materials and Methods: A total of 270 E. coli and 219 K. pneumoniae isolates were recovered during the period between August 2009 and July 2010. Kirby-Bauer disk diffusion method was performed to determine the antibiotic resistance pattern. Screening and phenotypic confirmatory test for ESBL production were performed using standard disc diffusion methods. 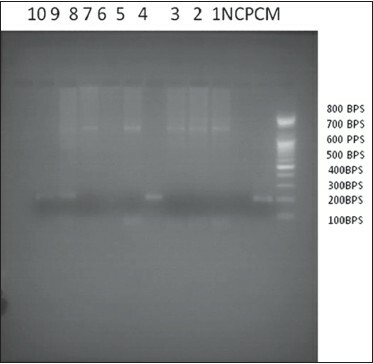 Each of the initial ESBL screening test isolate was investigated for the presence of blaTEM , blaSHV and blaCTX-M genes via polymerase chain reaction (PCR) using gene-specific primers. Results: Phenotypic confirmatory test able to detect ESBL production in 73.58% of E. coli and 67.24% of K. pneumoniae. However, PCR amplification showed the presence of one or more ESBL genes in each of the initial ESBL screening positive isolate. Among three ESBL genotypes, the most prevalent genotype was found to be blaCTX-M in E. coli (88.67%) and blaTEM in K. pneumoniae (77.58%) ESBL producing isolates. Majority of ESBL producing isolates possess more than one ESBL genes. 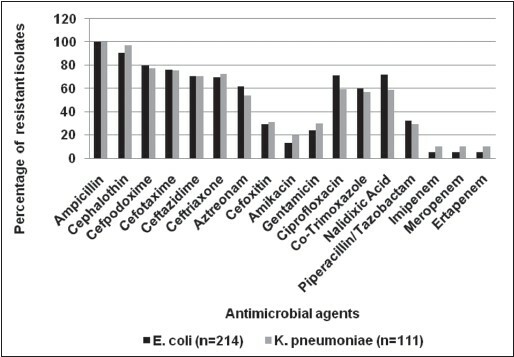 Conclusion: This study constituted a primer report on high prevalence of blaTEM and blaCTX-M genes in ESBL producing isolates of E. coli and K. pneumoniae and denotes the need of more extensive studies on these antibiotic genes to determine the magnitude of the problem of antibiotic resistance exiting in this locality. Context: Plasmid mediated AmpC (pAmpC) β-lactamase producing Escherichia coli are an emerging problem worldwide as they are now exhibiting resistance to multiple classes of antibiotics and are a major cause of therapeutic failure. Aims: The aim of this study was to characterize pAmpC β-lactamase producing extraintestinal E. coli, their phylogenetic distribution, resistance pattern, treatment options, and impact on patient's clinical outcome. Settings and Design: This descriptive study was carried out in a multi-specialty tertiary care hospital. Materials and Methods: A total of 300 clinically significant, non-repeat isolates were studied. AmpC disk test was used for phenotypic AmpC-β-lactamase detection. Molecular types of pAmpC were determined by a multiplex polymerase chain reaction (PCR). 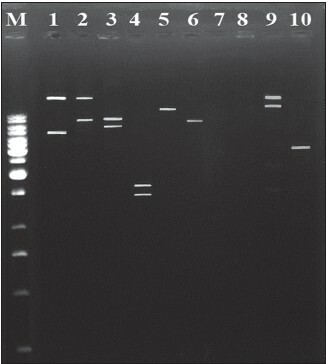 Phylogenetic analysis was performed by triplex PCR methods. Metallo-beta-lactamase (MBL) detection was done by E test. Antibiogram, treatment, and clinical outcome were collected in a structured proforma. Results: Although 95 isolates (32%) were phenotypically positive for AmpC, PCR detected CIT type of AmpC gene in only 37 isolates. Majority of strains were from phylogroup A (85%) and B1 (58%) which are considered as commensal groups. Co-production of ESBL's was observed in 33 strains and 5 strains were found to be MBL producers. Most widely prescribed antibiotics were 3 rd generation cephalosporins (30%), carbapenems (19%) and aminoglycosides (16%). Conclusions: Plasmid mediated AmpC producing isolates were found to exhibit a high degree of drug resistance, and they mainly belonged to commensal strains possibly due to misuse of antibiotics. Proper antibiotic policy is required to limit the spread of pAmpC producers or else it will lead to a therapeutic dead end in the near future. Background: There has been increasing attention paid in recent years to the possibility that oral bacterial infection, particularly periodontal disease may influence the initiation and or progression of systemic diseases. These studies confirm the observation that heart disease is the most commonly found systemic condition in patients with periodontal disease. Moreover, the literature has also highlighted substantial evidence indicating the presence of Gram-negative periodontal pathogens in atheromatous plaques. Aim: This study intends to investigate the possible association between periodontal health and coronary artery disease by evaluating periodontal status, association between the periodontal plaque and coronary atheromatous plaques for presence of micro-organisms such as, Aggregatibacter actinomycetemcomitans, Porphyromonas gingivalis, Prevotella intermedia, and Tannerella forsythia. Materials and methods: A case-control study was designed with seven patients who had undergone coronary endarterectomy for cardiovascular disease and 28 controls. The periodontal examination for cases was performed 1 day before vascular surgery and the controls were clinically examined. The atheromatous plaque sample collected during endarterectomy and the intraoral plaque samples were subjected to polymerase chain reaction for identification of A. actinomycetemcomitans, P. gingivalis, P. intermedia and T. forsythia. Results: The presence of periodontal bacteria DNA in coronary atheromatous plaques and sub-gingival plaque samples of the same patients was confirmed by this study. CONCLUSION A correlation was established between putative bacteria contributing to atheromatous plaques and species associated with periodontal disease. One particularly important study to be carried out is the investigation of a possible clinically meaningful reduction in coronary heart disease resulting from the prevention or treatment of periodontal disease. Background: The aim of this study was to investigate the significance of positive expression of Mycobacterium tuberculosis, (MTB) antigen in the cerebrospinal fluid (CSF) monocytes in diagnosing tuberculous meningitis (TBM). Materials and Methods: A total of 50 inpatients of TBM, 30 viral meningitis and 20 healthy controls were studied at the 1 st , 2 nd , and 4 th week during their treatment course. Immunohistochemical assay were used to detect early secreted antigenic target 6 (ESAT-6) positive cells, and positive cases were also observed. Results: The percentage of positive cases and positive cells of ESAT-6 in CSF monocytes were all higher in the 1 st and 2 nd week than in the 4 th week in TBM patients (P < 0.01); and percentage of positive cases and positive cells of MTB antigen in CSF monocytes were higher in TBM patients than in viral meningitis and health control in the 1 st and 2 nd week (P < 0.01). The sensitivity was 90% and the specificity was 92% in the early stage (within 2 weeks) of TBM. Conclusion: The positive expression of ESAT-6 in CSF monocytes is helpful for the early diagnosis of TBM. Primary musculoskeletal myoepithelial tumors (METs) are distinctly rare tumors and are being increasingly recognized as a result of improved diagnostic criteria and objective confirmation with immunohistochemical markers, including epithelial markers. Recent studies have unraveled distinct molecular mechanisms underlying these tumors. 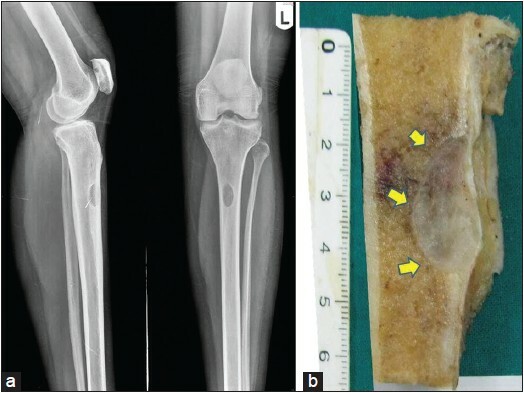 Herein, we present our second diagnosed case of an intraosseous MET that occurred in the tibia of a 37-year-old lady. The case is discussed with regards to current clinicopathological perspectives on these rather uncommon tumors, including our personal experience. Background: Cystoisospora (Isospora) belli is a coccidian, protozoan parasite that resides in the gastrointestinal tract of humans. It is mainly reported from HIV-positive individuals. However, a few cases have been reported in other immunosuppressed individuals including renal transplant patients, and those with lymphoma and leukemia. 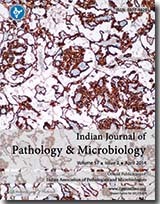 Materials and Methods: During a period of 5 years (2008-2012), approximately 1700 stool samples of immunosuppressed patients were screened for the presence of opportunistic parasitic infections by a modified acid fast staining technique. Results: A total of 41 C. belli were reported, out of which 30 were HIV-positive individuals while 11 were HIV negative. The latter individuals were also immunosuppressed due to prolonged use of steroids or other immunosuppressive drugs. Twenty-six out of 30 HIV-positive patients and all the HIV-negative individuals with C. belli infection had diarrhea. Conclusion: All immunosuppressed individuals should be examined for the presence of opportunistic coccidian parasitic infections and treated accordingly and alternatively, isolation of opportunistic parasites should trigger a hunt for immunocompromised state to reduce the morbidity and mortality in such patients. A new subspecies of Staphylococcus hominis described by Kloos et al. in 1998 and named S. hominis subsp. novobiosepticus (SHN) has been implicated in nosocomial outbreaks. Multidrug resistance, including resistance to novobiocin and oxacillin, is a particularly important feature of SHN. In our institute, we encountered 13 cases of S. hominis subsp. hominis in cancer patients with septicemia, of which seven were methicillin resistant. The isolates were identified by VITEK ® 2 compact automated system, using GP REF 21342 identification card and antimicrobial susceptibility testing card P-628. The biochemical reactions and antibiotic susceptibility pattern of the seven methicillin-resistant isolates were re-analyzed and patient details were re-checked to finally identify them as SHN. The increasing number of cases reporting isolation of SHN from biological specimens point to potential virulence and clinical importance of this bacterium. Extragonadal germ cell tumors are rare and comprise 2-5% of all germ cell tumors. Seminoma/dysgerminoma, teratoma, yolk sac tumor (YST) and mixed germ cell tumors are few of the extragonadal germ cell tumors arising within the brain. Of these, primary pure YSTs arising in the brain are extremely rare and arise in the pineal (62%) and suprasellar (31%) regions. Primary YST occurring in the cerebellum is exceedingly rare, associated with a very poor prognosis and has been reported in less than 10 cases in literature. 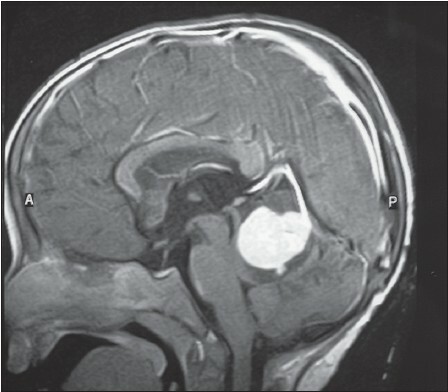 We herein report a case of primary pure yolk sac tumor in the cerebellar vermis in a 2-year-old child. Apocrine hidrocystomas (AHC) are uncommon cystic lesions of apocrine glands and are most often solitary. They are usually found in the head and neck region. Multiple AHC have been rarely reported in the literature usually in the eyelids and face. On extensive search of literature, we came across only a single case report of multiple axillary AHC. We report a case of a 31-year-old female who presented with fullness and discomfort in bilateral axillae, so a clinical diagnosis of bilateral accessory breast was made. However on histopathological examination, it turned out to be bilateral multiple AHC associated with apocrine hyperplasia. Sarcomatoid carcinoma is a rare malignant tumor that has both malignant epithelial and mesenchymal components. 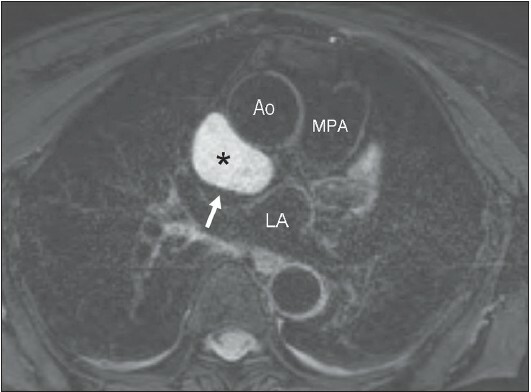 We describe a sarcomatoid carcinoma arising in the left renal pelvis of a 49-year-old man. The dominant component of the tumor was chondrosarcomatous, but there were also focal carcinomatous areas. The carcinomatous tumor cells consisted of papillary urothelial carcinoma. Immunohistochemical assay showed that the sarcomatous tumor cells were positive for vimentin and S 100 and negative for cytokeratin. The papillary urothelial carcinoma was positive for cytokeratin and negative for vimentin. 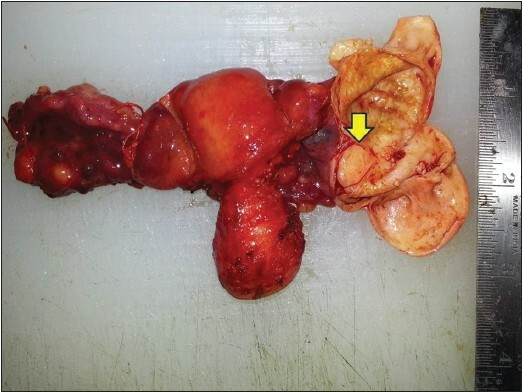 The patient underwent neoadjuvant chemotherapy and after downsizing the tumor, radical nephrectomy was performed with excision of the cuff of bladder. Melanomas arising in the skin, mucous membranes, and eye are encountered commonly than melanomas involving the breast. Melanomas in the breast are usually metastatic. Primary melanoma of the breast is extremely rare. We report a case of malignant melanoma of breast (primary/metastatic) that presented as a breast lump in a patient with no detectable cutaneous, mucosal or ocular lesion and who is a known case of squamous cell carcinoma of the oral cavity and had relapsed twice. The unexpected challenges faced during the diagnosis prompted us to report this case. Adenomatoid odontogenic tumor (AOT) has a limited biological profile and been an attention-grabbing tumor for a century for its origin. Though described earlier, it was widely accepted after Harbitz from Norway reported about this uncommon benign tumor in 1915. There has been a long debate as whether this tumor is a hamartoma or a neoplasm. Here, we present a case of AOT in a 20-year-old female with details of clinical, radiological and histological features along with clear cell changes, signifying AOT to be more aggressive in nature than assessed from earlier literature. Thus, we did an extensive search of PubMed literature on AOT with all its histopathological features associated until date to find the report of clear cell changes yet. Medulloblastoma is an embryonal neuroepithelial tumor of the cerebellum and is the most common malignant central nervous system tumor in children. Different histological variants and patterns have been described. The classic variant represents the majority of cases. 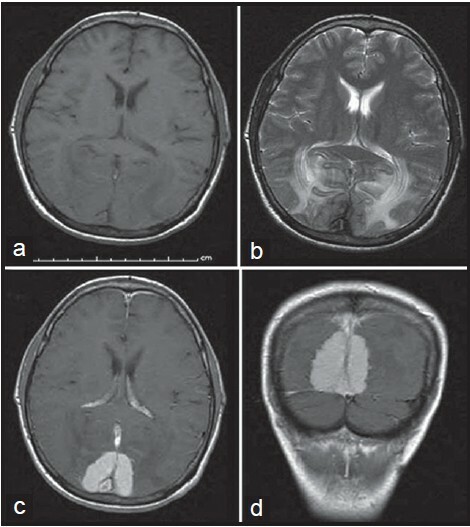 This report describes a rare case of large cell/anaplastic medulloblastoma with myogenic, melanotic and neuronal differentiation arising in the cerebellum of a 3-year-old boy who presented with headache and vomiting. 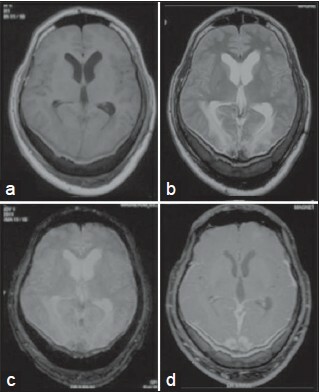 Magnetic resonance imaging demonstrated a heterogeneously enhanced lesion in the fourth ventricle. Surgical resection of the tumor was accomplished, but a residual tumor was left behind because of the involvement of the brainstem. Postoperatively, the patient received chemotherapy and radiotherapy. Currently, 20 months after treatment, the patient has survived without further progression. Pathological examination revealed a high grade primitive neuronal tumor with foci of myogenic features, melanin containing epithelial elements and ganglion-like cells, which were confirmed by immunohistochemistry. Primary primitive neuroectodermal tumors (PNETs) of the kidney are quite rare and can be mistaken for a wide variety of other small round blue cell tumors which includes rhabdomyosarcoma, Wilm's tumor, carcinoid, neuroblastoma, clear cell sarcoma of the kidney, lymphoma etc. Renal Ewings/PNET can occur in the age group from 4 to 61 years. Approximately, 90% of Ewing sarcoma (ES)/PNET have a specific t(11;22) which results in a chimeric EWS-FLI-1 fusion protein. Immunohistochemical for the carboxy-terminus of FLI-1 is sensitive and highly specific for the diagnosis of ES/PNET. Herein, we have an interesting presentation in a 23-year-old male who came with neck pain and progressive quadriparesis and was diagnosed as a case of poorly differentiated malignant tumor with a differential of lymphoma versus metastatic renal cell carcinoma. The patient's condition deteriorated fast and he had a rapid downhill course. The final diagnosis of Ewings/PNET was confirmed at autopsy. Here, we report a case of a 16-year-old female patient was referred with scalp swelling and headache. 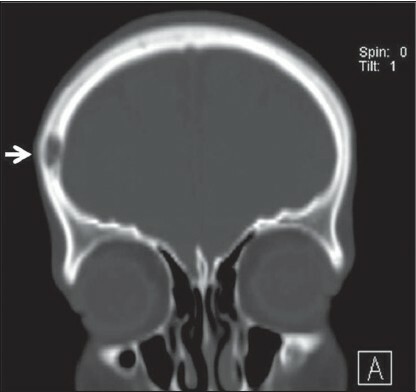 Her neurological examination was normal and imaging of the skull revealed a well-defined lytic lesion measuring 15 mm × 6 mm to the right of the frontal bone. She was operated on with a prediagnosis of Langerhans cell histiocytosis. A wide excision with negative margins was made and the defect was reconstructed with a titanium plate. Subsequently, the lesion was histopathologically diagnosed as an angiolipoma of the frontal bone. The postoperative period was uneventful and she remained well during 1-year follow-up with no evidence of recurrence. 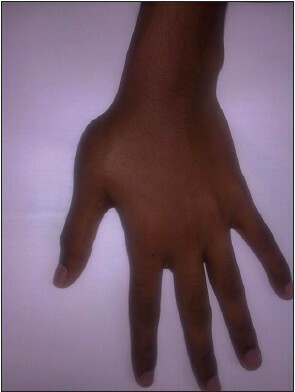 Angiolipomas are rare benign lipomatous lesions located mostly in subcutaneous tissue of the forearm or trunk and frequently occur before puberty or in young adults. They are not common in bones. To the best of our knowledge, this is the first angiolipoma of the frontal bone reported. Ameloblastoma is a neoplasm of odontogenic epithelium, especially of enamel organ-type tissue that has not undergone differentiation to the point of hard tissue formation. Granular cell ameloblastoma is a rare condition, accounting for 3-5% of all ameloblastoma cases. 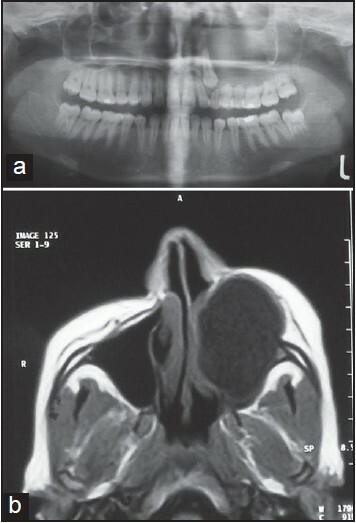 A 30-year-old female patient presented with the chief complaint of swelling at the right lower jaw region since 1 year. Orthopantomogram and computed tomography scan was suggestive of primary bone tumor. 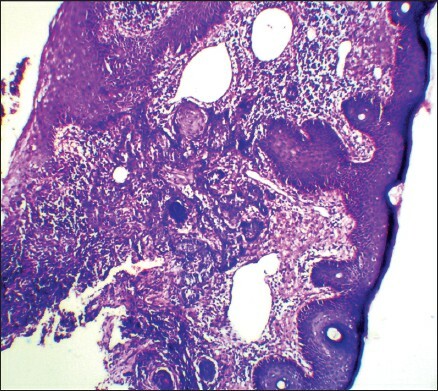 Histopathologically, diagnosis of granular cell ameloblastoma of right mandible was made. 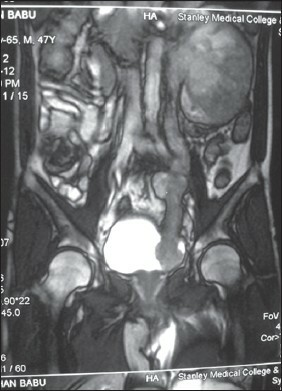 A 15-year-old male presented with progressive weakness of both lower limbs with urinary incontinence. 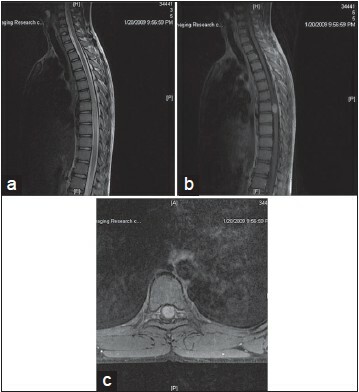 Magnetic resonance imaging revealed a spinal intramedullary mass at D7-D8 level. The child was operated with a preliminary diagnosis of an intramedullary tumor. Atypical ependymoma and astrocytoma were considered in the differential diagnosis. 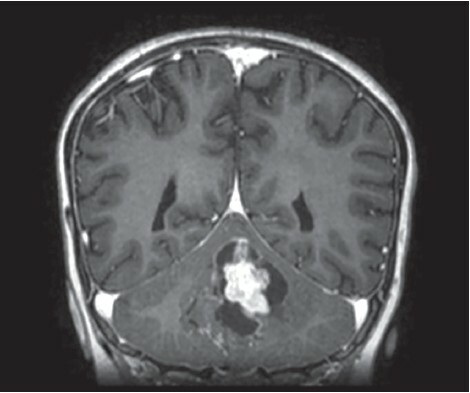 Per- and post-operative histopathological examination reported the case as transitional meningioma (WHO Grade I). Spinal intramedullary meningiomas being a rare entity may be confused with other common intramedullary tumors. Though, rare still the possibility of an intramedullary spinal mass of being a meningioma does exist and therefore should be considered in the differential diagnosis of intramedullary tumors. Malignant mesenchymal tumors of the breast other than angiosarcoma are extremely rare and comprise <0.5% of breast tumors. Primary chondrosarcoma of the breast is an extremely rare entity and only 10 cases are reported as single case reports in literature until date. A diagnosis of primary mammary sarcoma can be established only after excluding metaplastic carcinomas and malignant phyllodes by extensive sampling for evidence of in situ or invasive carcinoma. 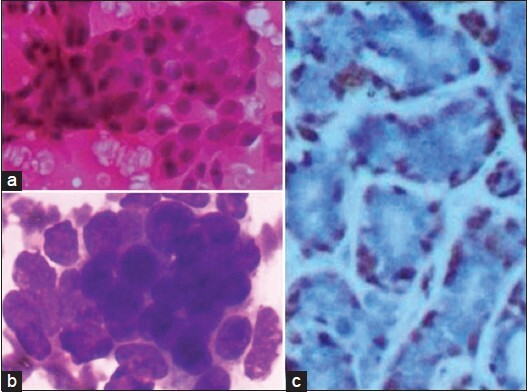 Here, we report a primary chondrosarcoma of breast in a 55-year-old lady diagnosed precisely on fine-needle aspiration cytology and confirmed by histopatholigcal examination after total mastectomy. We emphasize on diagnostic difficulties encountered in cytology smears and discuss differential diagnoses. The development of a second primary cancer after treatment of the first with radiotherapy or chemotherapy is well documented. Multiple metachronous primary cancers are known to occur in an individual, but it is often seen with hematological malignancies of childhood. The prevalence of multiple primary malignancies (MPM) is between 0.73% and 11.7%. The most frequent malignant associations are ovary-colon, ovary-breast, and breast-breast. The possibility of developing a second metachronous cancer 5 years after undergoing treatment of the initial head and neck cancer is approximately 22%. Here, we report two cases of multiple metachronous malignancies in head and neck region. A 46-year-old woman presented with thyroid and salivary gland neoplasms metachronously and another 21-year-old woman with Hodgkin' s Lymphoma, mucoepidermoid carcinoma of salivary Gland, and follicular variant of papillary carcinoma of thyroid. 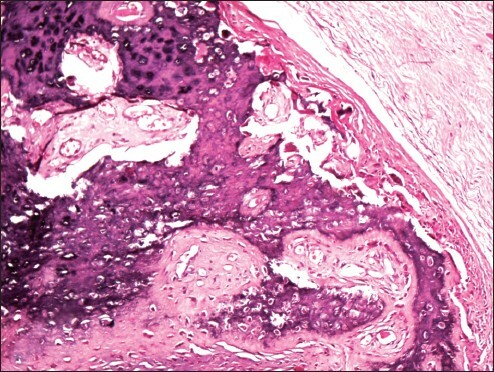 Atypical or symplastic leiomyoma is a rare histological variant of leiomyoma. This is a case report of 63-year-old patient who underwent hysterectomy with bilateral salpingo-oophorectomy. 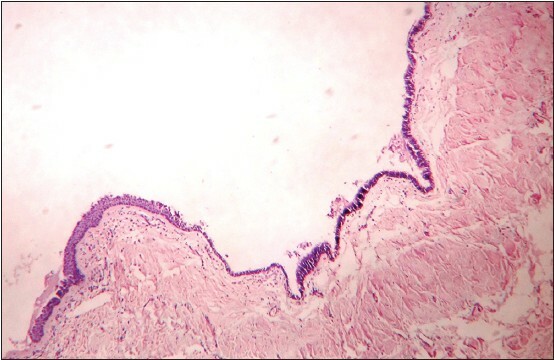 Histopathology of the polypoid growth seen in the endometrial cavity revealed atypical leiomyoma infiltrated by endometrioid cancer. Atypical leiomyoma can be misdiagnosed as leiomyosarcoma. Thus, carcinosarcoma was ruled out as it has an ominous prognosis. 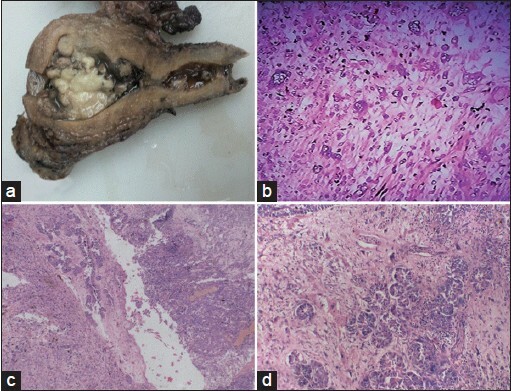 A diagnosis of atypical leiomyoma infiltrated by endometrioid cancer was given. We report this case as there are very few case reports of the above two pathology occurring simultaneously in the same patient. Plasmacytoid urothelial carcinoma (PUC) of the urinary bladder is an uncommon and aggressive variant of urothelial carcinoma associated with late presentation and poor prognosis. Immunohistochemical examination showing expression of epithelial markers, CD138, and losing the membranous expression of E-cadherin confirms evidence of PUC. 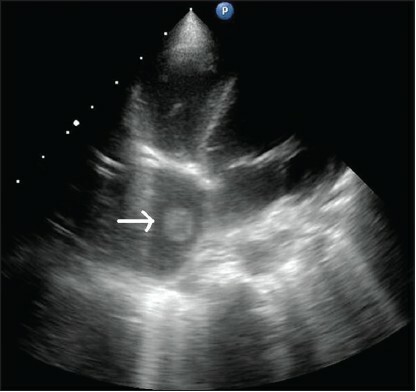 Here, we report a case of bladder PUC of a 74-year-old male who presented with hematuria. A transurethral biopsy revealed urothelial carcinoma with plasmacytoid appearance. The diagnostic dilemmas of this unusual variant of urothelial malignancy and its clinical impact are discussed. 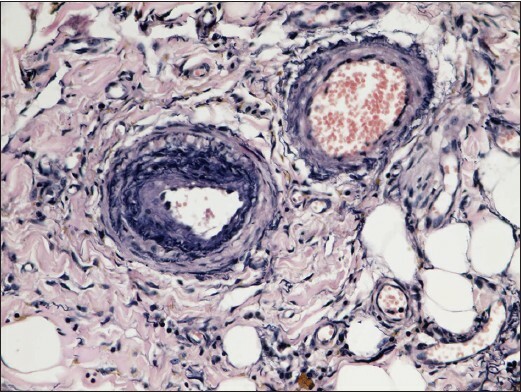 The pathological diagnosis was PUC (High-grade, pT4N2M0) with diffuse muscle, small tracts, and vascular invasion, in which almost of the areas studied on the tissue section showed Plasmacytoid differentiation. Solitary plasmacytoma of the bone (SPB) is a plasma cell neoplasm that usually presents as a lytic lesion mainly localized within the axial skeleton. The occurrence of SPB in young individuals is exceedingly rare, but has been sporadically reported before. We report a case of SPB involving metacarpal bone in a 16-year-old male with a prior history of trauma at the same site. Enteropathy associated T cell lymphoma (EATL) is a rare type of T-cell lymphoma, often associated with a history of celiac disease. It usually arises in the jejunum, but can involve other gastrointestinal tract sites such as stomach and colon. Monomorphic variant of EATL often occurs without a history of celiac disease, has variable histologic evidence of enteropathy, and is usually CD56 + . 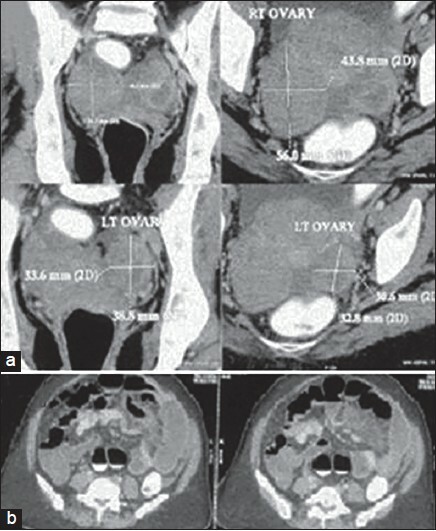 We report a case of EATL in a 49-year-old female presenting as bilateral ovarian masses. The morphology and immunophenotypic features were compatible with monomorphic variant of EATL. Among the liver abscesses, thrombosis of the inferior vena cava (IVC) has been reported mainly in amoebic liver abscess (ALA) caused by Entamoeba histolytica (E.H). It is an unusual complication especially in paediatric age group. Association of hypercomplementemia and IVC thrombosis has not been discussed previously. Published data suggest that E.H can activate the complement system and can cause hypercomplementemia. A very few studies suggest that complement activation and hypercomplementemia are associated with thrombus formation. 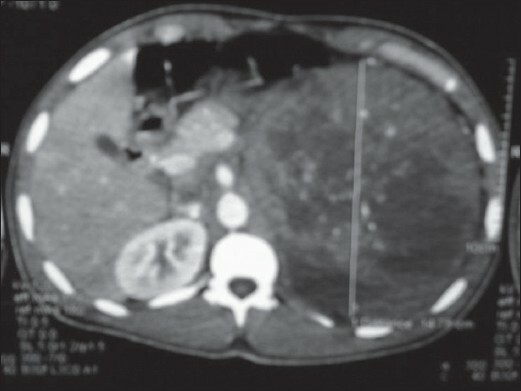 We describe a paediatric case of ALA complicated by IVC thrombosis extending to the right atrium and discuss the possible role of hypercomplementemia in causation of IVC thrombosis in cases of ALA.
A 34-year-old immunocompetent man weighing 95 kg was operated for a small left parietal scalp swelling in the year 2002. He was well until 2008, when he developed chronic diffuse headache, vomiting and drowsiness. 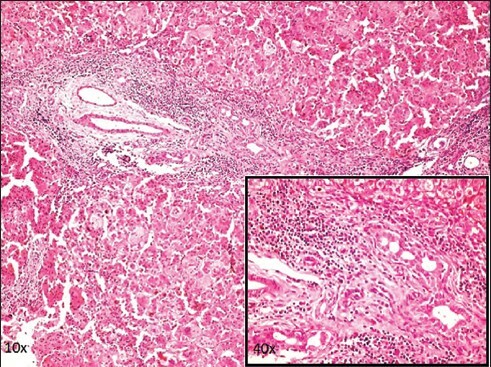 The left parietal dura and overlying vault biopsy showed evidence of granulomatous pachymeningitis with osteomyelitis secondary to nocardiosis. He had responded well to inadequate antibiotic therapy. After a dormant period of 3 years, there was recrudescence of severe raised intracranial tension symptoms in 2011. Magnetic resonance imaging showed diffuse pachymeningeal thickening mainly involving the occipital dura, posterior falx, and tentorium cerebelli. In addition, well-defined small nodules with hypointense signals on both T1- and T2-weighted images were seen in occipital lobes. Patient was treated with three drug regime with good recovery at 3 months follow-up. This is a rare case of central nervous system nocardiosis with skull vault osteomyelitis and a protracted clinical course. Mycobacterium chelonae is a rapidly growing mycobacterium that is found all over the environment, including sewage and tap water. They are important species associated with chronic non-healing wounds. 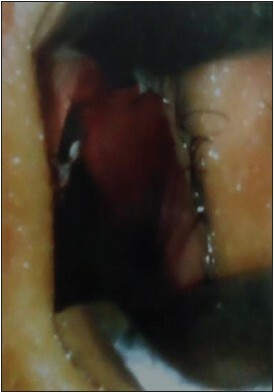 We report a case in a 41 year old female patient who underwent multiple surgeries for an ovarian cyst, tubo-ovarian abscesses with peritonitis and a repair of an abdominal incisional hernia.